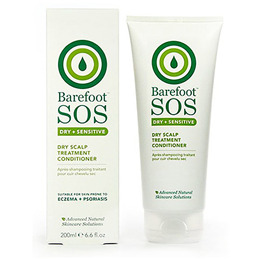 Barefoot SOS Dry Scalp Treatment Conditioner is a moisturising conditioner made from MSM, rice extract and essential vitamins combined with potent licorice, coltsfoot and willow to promote glossy hair and soothe dry, irritated scalps, while fragrant herbal extracts of rosemary, lemon tea tree, geranium, and Himalayan cedarwood provide an invigorating aroma. Barefoot say: Our experience is that this works quickly to help dandruff, scalp psoriasis, and irritated scalps. Works brilliantly on hair and scalps. Suitable for daily use. Massage into scalp and hair for best results. Suitable for all hair types, especially for dry, sensitive or dandruff-prone scalps. Use daily by massaging a small amount into the scalp and hair with the fingertips. Leave for 10 minutes, then rinse thoroughly. For best results, use with our Dry Scalp Treatment Shampoo. For External Use Only. It is important to patch test if you think you may be sensitive to any ingredients used, especially for children under 3 years old. Below are reviews of Barefoot SOS Dry Scalp Treatment Conditioner - 200ml by bodykind customers. If you have tried this product we'd love to hear what you think so please leave a review. I use this with the shampoo & it has stopped the itchy/flaky/dry scalp issue & also leaves my hair feeling really soft. But my hair has started looking greasy within a few days of using, so needs washing more often. 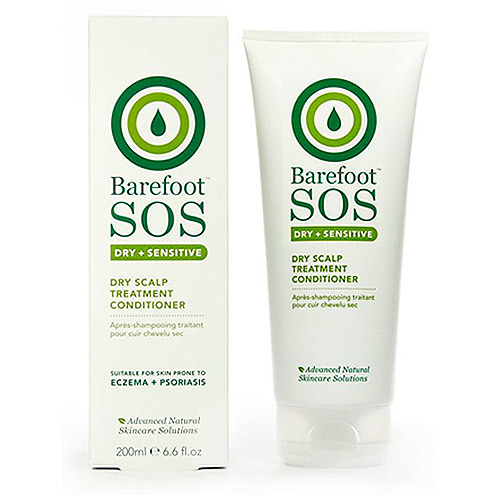 Barefoot SOS Dry Scalp Treatment Conditioner is a moisturising conditioner made from MSM, rice extract and essential vitamins combined with potent licorice, coltsfoot and willow to promote glossy hair and soothe dry and irritated scalps.